Large tracts of the 22,500 hectare Remutaka Forest Park are cloaked in dense native forests and make up one of the largest untouched contiguous areas of indigenous forest in the Wellington region. The biodiversity and appearance of the Catchpool entrance to the park, however, has been degraded historically by both farming and exotic forestry plantations. When the pine forest plantation on the hills surrounding the lower Catchpool Valley was clear-felled recently, many local residents felt that the resulting denuded hills and gullies were an eyesore. (Actually, more damage was done by the 'weather-bomb' and floods that devastated the area in March, 2005). 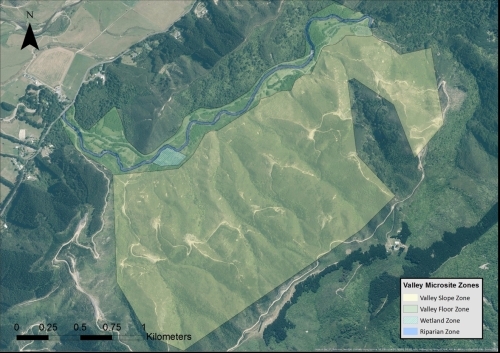 With the clear-felling of the Radiata pine forest on the other side of the Catchpool Stream over a ten year period following 1997 and the visible devastation of the surrounding landscape, it was resolved to re-forest the slopes and river valley once again with native plants in an attempt to restore the biodiversity values and increase the attractiveness of the area to tourists and regular visitors to the Park. The Remutaka Conservation Trust has taken on the task of revegetating the Catchpool in an attempt to restore its biodiversity values to those that may have prevailed before human intervention occurred in the valley. This project aims to give Nature a helping hand to speed up the reforestation of the hillsides with native plants and trees in order to quickly restore the original biodiversity of the area and to provide plenty of food and a healthy habitat for indigenous species of birds, lizards, amphibians, fish and invertebrates. Our simple strategy is to plant large numbers of different & desired eco-sourced plant species in the gullies and other sheltered areas to give them a head-start over natural regeneration processes. To ensure the health and well-being of the Catchpool and Graces Streams, we engage in riparian planting and remove pest plants. We have a permit to collect seed from the park (ensuring the eco-sourced nature of our plant stocks) and grow them in our nursery behind the DOC Field Centre not far from the Park entrance. Each year Trust volunteers, together with the welcome and able assistance of hundreds of corporate volunteers and school children, then plant the native species throughout the restoration zones during autumn and the winter months. In spring and summer, these same groups tend to those plants by releasing them and undertaking pest plant removal and a myriad of other site maintenance tasks. Follow this link for more detailed information about this project and its current status. The Trust was successful in obtaining funding for this restoration work in the park over the next two years. A total of $40,000 ($20,000 a year) is available to purchase plants to restore some areas in the Catchpool Valley where the pines have been removed. The small pockets of existing native bush will be given a helping hand with additional planting to create a more diverse range of flora, thus creating a seed bank for further natural dispersal. This also gives us the opportunity to perhaps re-introduce plant species into the park which have become extinct in that area. Additionally, it will provide a great opportunity for community and corporate groups to take ownership of a ‘plot’ and to maintain them on a regular basis. If you are interested in becoming involved in this project, please contact our webmaster and Catchpool Restoration Project coordinator, Peter Cooper. Many thanks! On a beautiful Spring day in the Park, the ANZ National Bank group are shown here after their terrific planting and restoration efforts with Ian (RFPT) and David (DoC). Photo credit: PC. 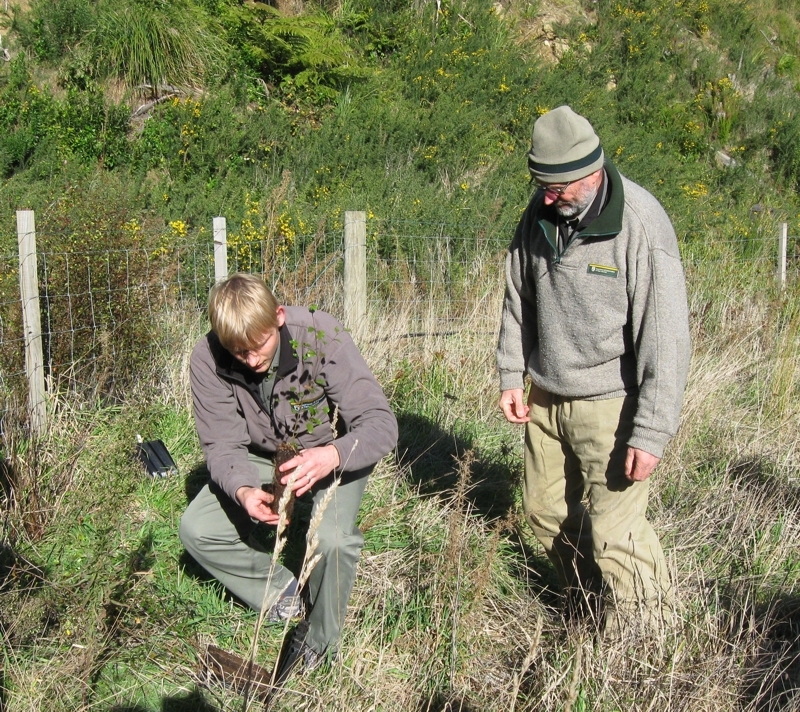 Brent Tandy and Peter Simpson demonstrate the careful unpacking and replanting of native Hard Beech seedlings to volunteers and fellow DoC staff members who turned up in numbers during our initial Catchpool Restoration working bee. Without our help, Nature would take hundreds of years to regenerate beech trees in this area. More than 150 of these trees were planted that morning. 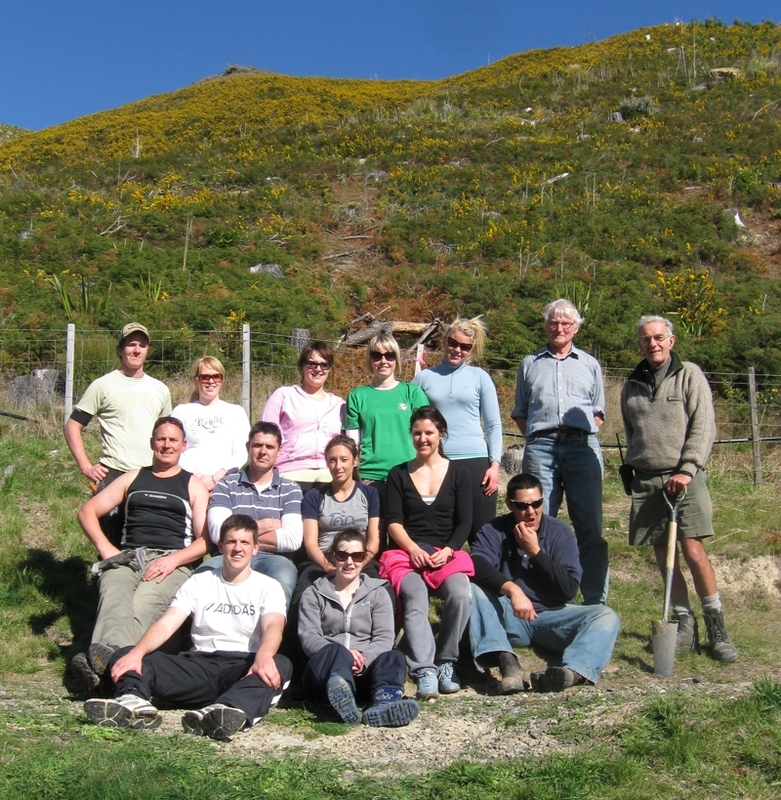 BNZ Call Centre staff clearing the way for planting, and releasing existing plantings in the Catchpool. Here's a map of the areas in the Catchpool Valley that were targeted for the first round of plantings. We were hoping to source and plant about 30,000 native plants and trees during the first two years of this project. 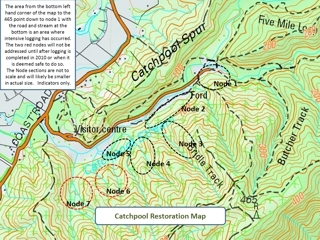 Map showing the new Restoration Zones applying to the revised Catchpool Restoration Project Plan (2018). Click for a larger view.